For liquid viscosity measurements a computer controlled system around a commercial Ubbelohde viscosimeter (Schott KPG Ubbelohde viscometer) was developed. The viscometer is arranged in a double wall glas cylinder for thermostating with a commercial circulating thermostat. To pump the liquid in the capillary a membran air pump controlled with valves is connected to the viscometer. The flowtime of the liquid is measured by photoelectric beams. A high precision thermometer (Pt100) is attached for temperature measurement. The complete control of the measurement system is carried out with the help of the Windows program "ViscoMeasurement". The control program is connected to the pure component databank of the Dortmund Data Bank (DDB-PCP). It is possible to run automatic temperature programs for high precision viscosity measurements up to 353 K (limited up to now by the thermostat) and a viscosity range from 0.3 to 100 mm²/s (cSt). For viscosity measurements of liquids and gases a capillary flow viscometer similar to that reported by Kobayashi and Kurase (Reports of the National Research Laboratory of Metrology (Japan) 26, 83, 1977) can be applied. This apparatus is applicable for viscosity measurements between about 180 and 480 K and up to 20 MPa. The capillary viscometer is schematically shown in the following figure. The core of the apparatus is a differential pressure indicator, which is connected to both sides of the thermostatted capillary. During a measurement run, the complete apparatus is filled with the liquid or gaseous mixture, or pure component, respectively. One of the syringe pumps which is loaded with the material to be analyzed is programmed to produce a constant flow, while the other is working in opposite direction. The viscosity can be derived from the difference in pressure at both ends of the capillary and the flow rate. 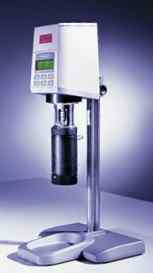 The commercially available Stabinger type viscometer SVM 3000 (Anton Paar, Graz, Austria) is a kind of a rotation viscometer with cylinder geometry. It was constructed using a modified Couette principle, with a rotating outer tube and a slower rotating inner measurement rotor. The determination of the viscosity is based on the simultaneous measurement of rotation speed and torque. A rotating magnet causes an eddy current field (hall effect) with an exact speed of rotation dependent retarding torque. The torque resolution is 50 pNm. The very small measurement cell contains a rotating tube with a constant speed of rotation, which is filled with the sample. 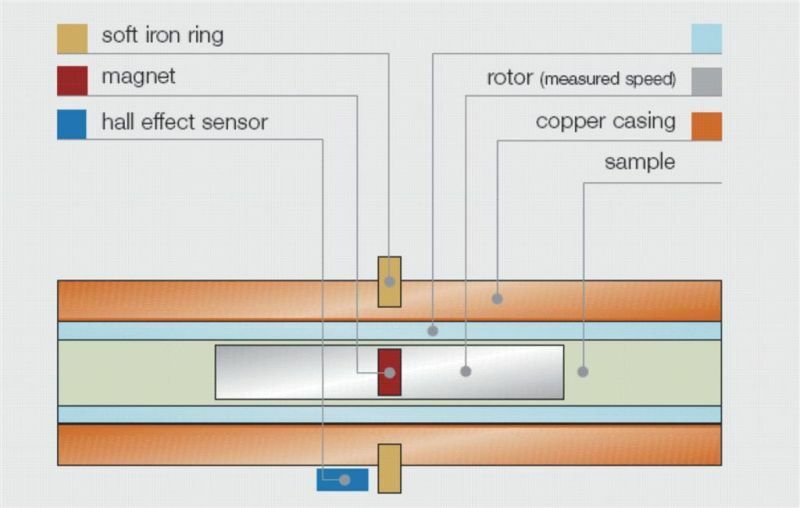 The measurement rotor (with a permanent magnet inside) is floating in this sample and because of its low density the rotor is centered by the centrifugal forces. This free floating rotor needs no bearing and therefore no friction occurs. The scheme of the measurement principle is shown in the following figure. 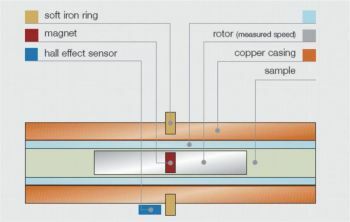 The rotor reaches a constant rotation speed shortly after starting the measurement, which is caused by the equilibrium between the brake action of the eddy current and the propulsive shear forces of the sample. The dynamic viscosity can be calculated from the rotation speed of the rotor. The density is needed to derive the kinematic viscosity from the experimental dynamic viscosity. Therefore, the SVM 3000 is equipped with a vibrating tube densimeter. Both measurement cells can be filled in one step and the measurements are performed at the same time. The SVM 3000 covers measurement ranges from lower than 1 up to 20 000 mPa s and from about 0.65 up to 3 g/cm³. The unit is thermostatted very rapidly and precisely with an integrated Peltier thermostat.